We get asked many times at food events – “do you have any Orange Pekoe?”. We’re normally hesitant to say yes, because sometimes a customer might not know exactly what they’re asking for. When we talk about Orange Pekoe, we’re referring to a wide range of black tea grades which can be complex with many subdivisions. To be precise, the Orange Pekoe leaf refers to the leaves next to the buds. The larger leaf below that is just called Pekoe, and the smaller leaves and buds above can have prefixes like Flowery, Tippy, Finest and Special. The origin of the use of ‘Orange’ has a few theories but one thing is for sure; it has nothing to do with orange flavourings, oils or leaves. At most it could be to do with the copper colour of many of the black teas that are covered by this grade. Another idea is that it comes from the Dutch royal house of Orange-Nassau who played a large part in bringing teas to Europe. 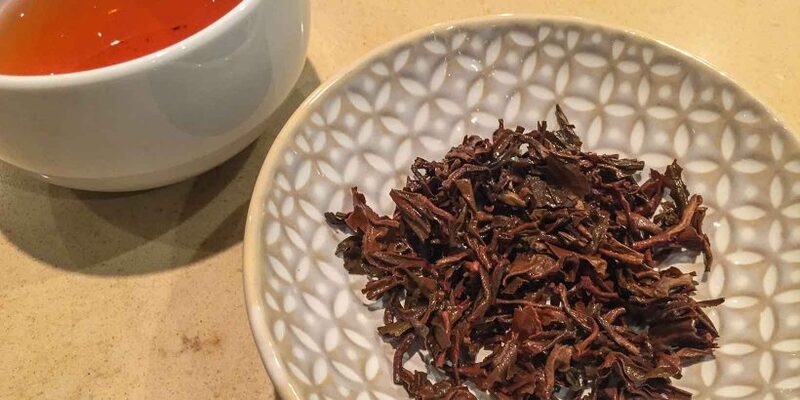 The term Pekoe is even more uncertain, but theories circle around it coming from Chinese words for either white flower or white hair, which describes the appearance of some high grades of black tea. It refers to the plucking of the buds and adjacent leaves of the tea plant. Ironically, Orange Pekoe is almost only used by non-chinese speaking countries. It was introduced by Europeans in a grading system when they started to grow tea in places like India, Nepal and especially Sri Lanka (Ceylon). 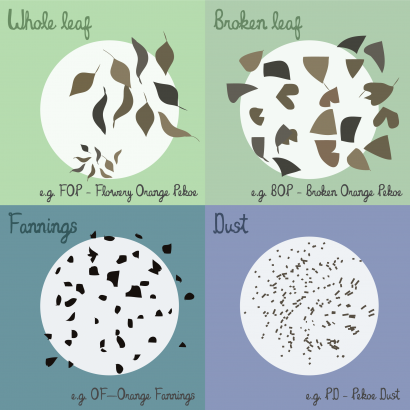 The term Orange Pekoe (or OP) appears in the highest grades of tea categories like Whole Leaf and Broken leaf but not in the lower ones, namely Fannings and Dust. Tippy Golden Flowery OP / TGFOP – Has a high proportion of very young (flowery) golden tea tips. Usually only used in Darjeeling and Assam. BP – Broken Pekoe: Most common broken pekoe grade. TGF BOP1 -Tippy Golden Flowery Broken Orange Pekoe 1: High-quality leaves with a high proportion of tips. Finest broken First Grade Leaves in Darjeeling and some parts of Assam. So we have decided that when anyone asks us if we have any Orange Pekoe, we will always say yes, because we only stock the highest quality black teas. If our loose leaf teas are not Orange Pekoe then its because they are from countries that use a different grading system.